The University of Texas, Austin. A couple of days ago, a team of neuroscientists from the University of Texas, Austin announced that they have created a new strain of mutant worms which is impervious to the intoxicating effects of alcohol! To create the alcohol-immune worms, the researchers implanted a modified human alcohol target – a neuronal channel called the BK channel SLO-1 that binds alcohol to the brain – into the genome of Caenorhabditis elegans worms. 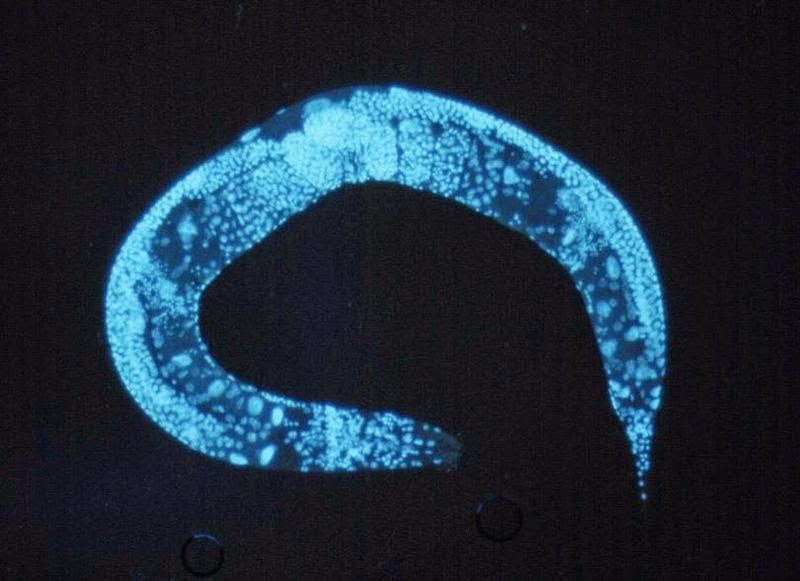 An alcohol target is any nerve cell molecule that binds with alcohol, whereas C. elegans is a free-living (non-parasitic), transparent nematode (roundworm), about 1 mm in length, that lives in temperate soil environments. "This is the first example of altering a human alcohol target to prevent intoxication in an animal." said Jon Pierce-Shimomura, corresponding author of the study and assistant professor in the university's College of Natural Sciences and Waggoner Center for Alcohol and Addiction Research. One important aspect of this modified alcohol target is that the mutation only affects its response to alcohol. Normally, the BK channel regulates many other important functions including the activity of neurons, blood vessels, the respiratory tract and bladder. The alcohol-insensitive mutation does not disrupt these functions at all. "We got pretty lucky and found a way to make the channel insensitive to alcohol without affecting its normal function." said Pierce-Shimomura. "Our findings provide exciting evidence that future pharmaceuticals might aim at this portion of the alcohol target to prevent problems in alcohol abuse disorders. However, it remains to be seen which aspects of these disorders would benefit." said Pierce-Shimomura. Unlike other drugs like cocaine, which have a specific target in the nervous system, the effects of alcohol on the body are complex, targeting numerous areas of the brain. Other aspects of alcohol addiction, like tolerance, cravings and withdrawal symptoms are probably influenced by different alcohol targets. The worms used in this study are a good model for alcohol intoxication, which causes them to slow their crawling and reduce the wriggling from side to side. They also stop laying eggs, which accumulate in their bodies and can be easily counted. 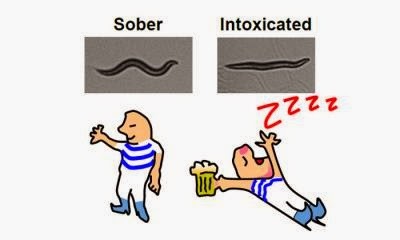 However, C. elegans is not an ideal model for alcohol addiction. Now, the team wants to take the research a step further. The modified human BK channel that was used in this study - which is based on a mutation discovered by lead author and graduate student Scott Davis - can be inserted into mice, which would allow them to examine if this alcohol target also affects tolerance, cravings and other alcohol-related symptoms. Interestingly, Jon Pierce-Shimomura said that future pharmaceutical applications could include a "James Bond drug", which would enable a spy to drink his opponent under the table, without getting drunk himself. The same drug could also be used to treat alcoholics, since it would counteract the intoxicating and potentially addicting effects of alcohol.